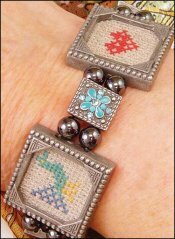 Photo Magnetic Stretch Bracelet  - $28.00 : Yarn Tree, Your wholesale source for cross stitch supplies. Item 3520. Photo Magnetic Stretch Bracelet. With room for 3 photos or stitching, this is a fun accessory item! Design openings are 3/4" (model was stitched on 20ct aida). Easy to insert your finished stitching. Fits an adult wrist 8" or less. Sold as assorted colors, there are four color styles. The beads are lightweight magnets so they may have some benefits as well. Introduced at the 2018 Nashville Needlework Market.